Welcome to my website. I’m Eoin Meegan. If you’re interested in greater self awareness, consciousness, personal development and exploring what life’s all about then you’ve come to the right place. I’ve been on a journey of personal awareness for over a decade now, and I share my own experiences and insights here, but I also want to hear yours. So feel free to drop me a line here. I’d love to hear your stories and opinions. What does “unscripted” mean anyway? Very simply, it is to recognise that we all have programs or ‘scripts’ from childhood (or possibly earlier) that erect barriers in our path and create false limitation. Awakening is seeing these programs, and where possible, eliminating them. That’s why I created this website. My philosophy is that at a certain level we are all perfect, and the notion that people need ‘fixing’, is a misconception. Often the problem is the mind. We are so busy thinking that we miss the point of why we’re here. Your reality is that you are way more powerful than you can imagine. You, see, there is a Consciousness, a Universal Mind if you like, that knows you and looks after you, and if you learn to work with this you can do pretty nicely. Further, this consciousness has nothing to do with religion or any preconceived notions of God which you may have. As well as writing, another of my passions is walking. 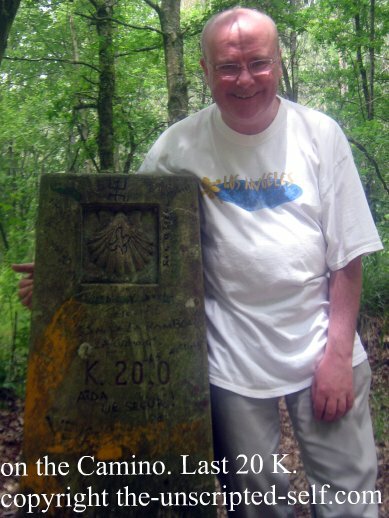 In 2009 I did the Camino de Santiago de Compostela in beautiful northern Spain. Maybe that’s where I got the inspiration to start this website! Here’s me at 20k to the end. Just imagine you met some famous movie director and he gave you a script for his latest film. You learn the role perfectly, you become a famous movie star. Then when the movie is made you cast off the role. You see life is a lot like that. We’re given these roles when we arrive here, but then we forget, and unlike the film we continue to play them our whole lives. I like the analogy of the actor. To become aware of the roles we’re playing is to become awake. To be awake is to be unscripted. The unscripted self is you. Now that you’ve discovered me I hope you decide to come along on the journey. It promises to be fun! Return from the introduction page to the home page.